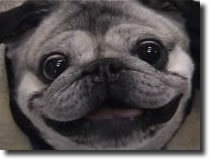 Pugs are living proof that God has a sense of humor. How else can you explain these funny-looking creatures with the flat faces, the loud snorts that pass for breathing, and the vast amount amounts of personality packed into such small frames? I have been blessed to count several of these little darlings as members of the family. 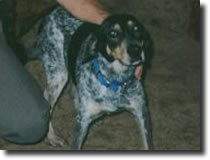 Duesy was my first dog, a blue tick hound, and my constant canine companion for sixteen years. She became an honorary member of the pug pack when Poco adopted her as his mother. 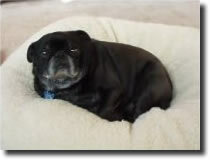 Poco was the first pug, my introduction to the breed. We raised him from a puppy, and he trained us well. He left us at the age of twelve. Click here to visit Poco's Page. 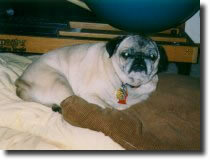 Rocky was my special boy, an older pug adopted through San Diego Pug Rescue to keep Poco company. Rocky also left us at the age of twelve. Click here to visit Rocky's Room. Austin is my current boy, sprung from the Flagstaff pound. Why would anyone throw away a perfectly good pug? 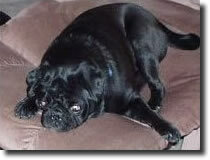 The most recent addition to the pack is Kramer, adopted through Arizona Pug Rescue in Phoenix. He's a bit wobbly on his hind legs, but participates fully on Pug Patrol each morning with Austin.